We got off to a late start today so let’s make it a good one. Score this one in the “You have got to be kidding me!” category, but Connecticut‘s loss to Providence last night was a debacle that perfectly sums up its season. The Huskies shot 46% from the field, led by as many as 14 in the second half, and still let the lowly Friars climb back into the game and eventually win. Most are now saying that this team doesn’t belong in the NCAA Tournament and they really don’t. You can’t lose nine of your last 13 games in the regular season and still expect the Tournament Committee to look favorably upon you, and you can’t play a must-win game against the worst team in your conference and blow a late lead to lose. Blaming this on interim coach George Blaney is a cop-out, though. Blaney may be too passive and he may not lead the team with the iron fist of Jim Calhoun, but Blaney is not responsible for letting one of the conference’s least efficient offensive teams go on a 26-5 run in the middle of the second half. UConn fans can scapegoat whomever they want, but this failure is on the players, plain and simple. The difference between UConn and West Virginia — who routed its inferior opponent, DePaul, in a must-win game at home — is leadership. UConn is a team full of talented underclassmen. West Virginia is a team that will only go as far as their two excellent seniors, Kevin Jones and Truck Bryant, who combined for 50 points last night in what was their final home game as Mountaineers, take them. 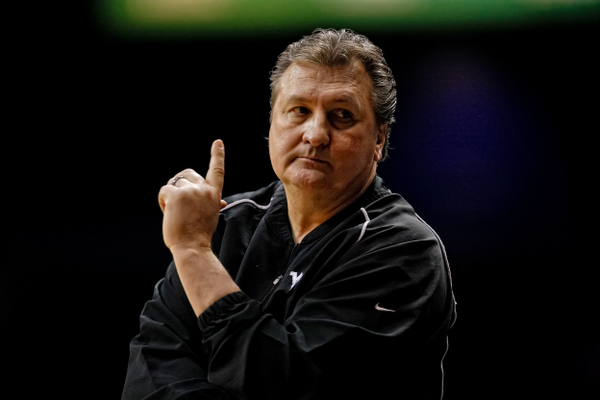 Bob Huggins‘ team has also been in a bit of a tailspin down the stretch, but if they can beat South Florida in Tampa this weekend, they may still be able to play their way into the NCAA Tournament. Looking ahead to tonight, the team with the best chance to impress the Tournament Committee is Cincinnati. The Bearcats play their final home game against No. 8 Marquette, a team that has been winning but hasn’t been dominating. The Golden Eagles are not the same team on the road as they are at home, and for Mick Cronin’s bunch, a win over a Top 10 team would likely cement their place in the NCAA Tournament heading into the Big East Tournament next week. The obvious matchup to watch will be the red-hot Jae Crowder squaring off with Cincinnati’s Yancy Gates who will be playing in his final home game. Allow me to take a minute to step away from bubble implications and talk about one player who is out of the spotlight thanks to his team’s unexpected struggles, and that is Pittsburgh do-it-all senior Nasir Robinson. Reading this article about Robinson’s season, it shouldn’t take long for you to love this guy. A 6’5″ power forward, Robinson doesn’t have a future in the NBA and his senior season has been a disappointment, but still he says he won’t make any excuses and all he does is talk about how he wants to help his teammates. The Panthers have had plenty of gritty players exactly like Robinson who make the most out of their limited potential (Brad Wanamaker immediately comes to mind) and that is a testament to coach Jamie Dixon‘s talent evaluation and coaching. This is why Robinson deserves some stand-alone recognition. He will be forgotten soon enough, but for now, let’s give the guy some love for an excellent career and leadership values he should be proud of. There will be a lot of mixed emotions in South Bend Friday night when Notre Dame seniors Scott Martin and Tim Abromaitis put on their uniforms for what might be the last time. Both players have petitioned the NCAA for a rare sixth year of eligibility but it seems unlikely that either will have their request granted. Of course Abromaitis will be in uniform but won’t play as he recovers from his torn ACL. There should be plenty of cheers from the Fighting Irish faithful, especially for Abromaitis, but there will also be a lot of people looking at him in uniform and wondering what could have been. Temple In Big East Talks: The Big East may have a new all-sport member as early as this fall if the reports are true that the Temple Owls are in discussions about joining the conference. Adding Temple to the mix would be terrific for Big East basketball. While Syracuse is irreplaceable, you could make an argument that Temple and Memphis offset the departures of West Virginia and Pittsburgh. The enhanced stature of these two programs in the Big East will help fuel recruiting and could easily make them equal to what WVU and Pitt are right now. Temple will make its fifth consecutive NCAA Tournament appearance next month, its 30th in a storied history. The Owls have made two Final Fours and five Elite Eights, better than both Pittsburgh and West Virginia (WVU has two Final Fours, Pitt has one). Memphis has been to more Final Fours and Elite Eights as well, although two were vacated (1985 and 2008). All in all, I’d argue that the Big East hit a grand slam with Temple and Memphis, should this all go through. The league simply couldn’t have done better given the constraints it faced. Punching Your Ticket And Voiding It In The Same Week: One could argue that Seton Hall and Cincinnati punched their NCAA Tournament tickets with wins over Georgetown and Louisville, respectively, last week. However, both squads lost over the weekend (to Rutgers and South Florida), wiping out the good vibes from huge home wins earlier in the week. As of right now, the Pirates and Bearcats are likely still in the Tournament, but in much more precarious positions than before. In late-season college basketball, nothing is ever a sure thing until all the games are played. A team’s status can change at a moment’s notice. Syracuse (29-1, 16-1) – The men in orange just keep moving right along, picking up two more wins this past week. Finding a way to win is so cliché, but it has been the theme with this group over the last few weeks. Syracuse has moved its record to 29-1 with seven of their nine wins since the loss to Notre Dame coming by ten points or less. In the win over South Florida, Syracuse overcame 35% shooting and a 20-7 Bulls run to start the game by going on a massive 26-0 run that started about midway through the first half and bled deep into the second. Kris Joseph struggled shooting, but Scoop Jardine picked him up by scoring 15 points. 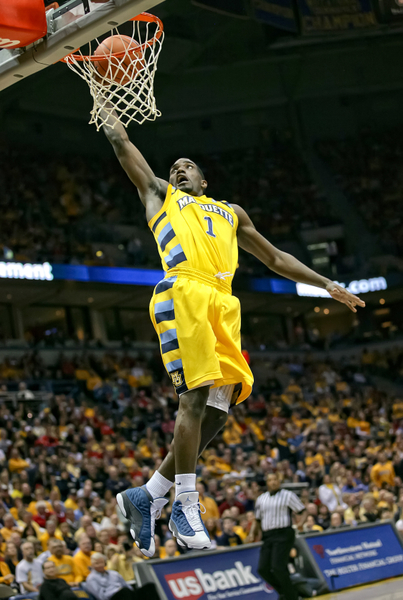 Joseph rebounded in a big way with 21 points at Connecticut while Fab Melo added 11 points and nine rebounds. This team has more weapons than any in the nation, allowing the Orange to overcome off nights by some of their key players. More importantly, Syracuse out-rebounded UConn, 39-35. That’s significant because of what the Huskies bring to the table in their front court and Syracuse’s awful rebounding numbers that have persisted throughout the season. With the win at UConn, Syracuse officially clinched the Big East regular season title, something everyone knew was going to happen as early as when the calendar flipped to January. This week: 3/3 vs. #23 Louisville. Evan Jacoby is a regular contributor for RTC. You can find him @evanjacoby on Twitter. See bottom of the post for the Official RTC Star System. There are a lot of good teams in action on Wednesday, but most of them are strong favorites in their games. The two best matchups of the night are taking place in the Big East and Big Ten. It seems like every game that West Virginia plays is a toss-up, and this one is no different. The Mountaineers have lost five of their last seven but are coming off a big win at Pittsburgh where they were slight underdogs. They are once again slight underdogs in South Bend to take on the red-hot Fighting Irish. WVU usually plays strong perimeter defense, which will force the Irish guards into running more difficult offense, but will the Mountaineers’ own guards provide enough scoring punch? Truck Bryant has been a good secondary scorer at 16.6 PPG in Big East play, but no other guard averages more than eight points per night. They need someone else to step up to complement Bryant and Kevin Jones. Jones remains a stud this season and you can all but lock up 20 points and 10 rebounds from him. The Mountaineers will try to out-tough the Irish by controlling the boards with their 54.1% rebounding percentage in Big East games, tops in the conference. Notre Dame hasn’t lost in over a month, winning eight straight games and all in impressive fashion. They didn’t look great in their Saturday night game at Villanova, but the Irish still came back from a 20-point deficit and closed out a road game in overtime. Five different Notre Dame players have led the team in scoring during its winning streak, and the offense has been tremendously well-rounded. They can pound the ball inside to Jack Cooley (12.2 PPG, 9.3 RPG), find surging Pat Connaughton from the outside (12.6 PPG in his last five games), or use strong guard duo Eric Atkins (13.0 PPG) and Jerian Grant (12.9 PPG) to make plays. The question will be whether Mike Brey‘s team can execute against WVU’s tough defense or grab any offensive boards against the strong defensive rebounding team. West Virginia is the best rebounding team in the Big East while Notre Dame’s 49.4% rebound percentage is just 13th in the conference. The Mountaineers could control this game if they dominate the boards, but otherwise the Irish should find a much easier time scoring with their diverse offensive sets. Notre Dame is just a three-point favorite in what is expected to be a tight matchup. Michigan State has won five straight, seven of its last eight, and looks like a strong candidate for an NCAA #1 seed. Draymond Green is fully healthy and continues to state his case for Big Ten Player of the Year, but it’s the secondary players that have come along. Freshman Branden Dawson continues to improve and has massive upside as a swing forward, while bigs Adreian Payne and Derrick Nix continue to play better and better as the season progresses. The Spartans remain one of the strongest defensive teams in the country and seem incredibly difficult to score on during stretches. There’s no reason to expect anything different against a struggling Golden Gophers offense. Tom Izzo‘s team is peaking yet again in the late stage of the season. Bubble Teams Hanging On: Four Big East squads reside in the purgatory known as Bubbleville, but all are still hanging on to their projected NCAA bids. Cincinnati, Seton Hall, West Virginia, and Connecticut are all projected to be in the NCAA Tournament field as of this writing according to ESPN’s Joe Lunardi, but it’s the Pirates who are really skating on thin ice. The Hall is one of the “last four in” and has a huge opportunity this week against Georgetown. Cincinnati has a similar opportunity against Louisville while West Virginia has two excellent chances to seal the deal this week. As for Connecticut, the Huskies appear to be imploding. How UConn responds against Villanova on Monday night and Syracuse this coming Saturday will determine its fate. South Florida Guaranteed a Winning Record: With its win at Pittsburgh on Sunday night, South Florida won its tenth Big East game for the first time ever and is now guaranteed at least a 10-8 Big East finish. However, the Bulls have their sights set higher. Thanks in part to a backloaded schedule, USF’s best win to this point is over bubble team Seton Hall, but upcoming games against Cincinnati and West Virginia could push the Bulls towards the field if they can win. South Florida needs to finish at least 12-6 in order to have a chance at a bid. Even with that, the Bulls will likely need to do a lot of work in New York City. A 12-6 league record is usually automatic, but not when your best non-conference win is Cleveland State. 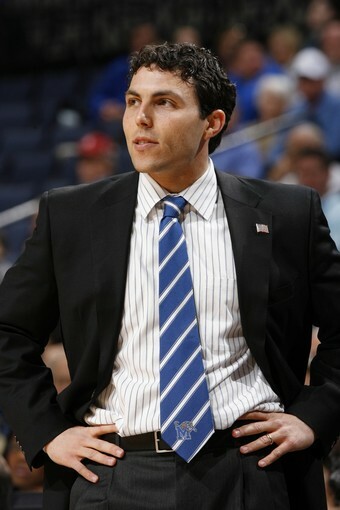 How much does Stan Heath want the close losses to Southern Miss (two points) and Connecticut (three points) back now? Darius Johnson-Odom And The Golden Eagles Embarrassed The Huskies On Saturday. Big East Adds Memphis: While conference realignment is unfortunately all about football, the addition of Memphis to the Big East Conference is a boon for basketball. With the league losing Syracuse, Pittsburgh and West Virginia, it needed a strong basketball program to limit the damage of three venerable programs departing. Memphis is perhaps the best the Big East could do from a basketball perspective and the Tigers will begin competing in the conference in the 2013-14 academic year. While the Big East cannot replace a program with the stature of Syracuse, Memphis is arguably at least as good, if not better, than Pittsburgh and West Virginia. Temple would be the next logical choice from a basketball perspective but Villanova has long been rumored to be firmly in opposition to the Owls joining the league. Conference realignment is a new reality and won’t end any time soon. Expect some more dominoes to fall over the coming months and years. West Virginia Reportedly Settles: Just 36 hours after Memphis joined the Big East, West Virginia reportedly settled with the Big East on an exit agreement, although no official announcement was made. If the Charleston Daily Mail report is correct, West Virginia will leave the Big East on July 1 of this year in order to join the Big 12 Conference. The reported agreement says that WVU will pay the Big East $11 million, with the Big 12 contributing $9 million. Big East bylaws require all member institutions to give 27 months notice before leaving the conference. If the Mountaineers do leave the conference, the Big East will have 15 basketball members for next season (2012-13) before expanding again in the summer of 2013. Of course, West Virginia’s early exit could pave the way for agreements with Syracuse and Pittsburgh, allowing those schools to leave early for the ACC. In a worst-case scenario, the Big East will have 13 basketball teams in 2012-13. One thing is for sure, this story is far from over. Stay tuned. NCAA Denies Connecticut’s Waiver Request: In what was another good move by the increasingly tough NCAA, the governing body denied a request by Connecticut to retain eligibility for the 2013 NCAA Tournament in exchange for self-imposed penalties. Those penalties included forfeiting revenue and playing a shorter schedule. The Huskies would not quality for next year’s tournament because of their low APR rating, below the four-year minimum requirement of 900 or two-year average of 930. UConn will appeal the decision, one that, if denied, could have a huge effect on the basketball program in Storrs. Will Jim Calhoun stick around? Will recruits want to come there and knowingly sit out a year? Many questions still need to be answered as the Connecticut basketball program enters a period of uncertainty. Win Number 880 for Jim Boeheim: The Syracuse legend now stands alone in third place on the all-time Division I wins list behind Duke coach Mike Krzyzewski and Bob Knight after Syracuse beat Georgetown last week. Number 880 is one better than Dean Smith, a legend in his own right at North Carolina. While it is unlikely that Boeheim can catch Krzyzewski since both will keep winning, the Orange coach can pass Knight early next season, especially if Syracuse goes on a deep NCAA Tournament run. It’s so rare to see an athlete or a coach stay at one school for his entire career in sports these days but that’s exactly what Boeheim has done. The Hall of Famer has been at Syracuse as a coach since 1969 and played for the Orange from 1962-66. What a truly remarkable career spanning 50 years (and still going strong). Fab Melo Returns: After missing three games due to an academic issue, Fab Melo returned to the Syracuse lineup Saturday afternoon in New York. Melo scored a career-high 14 points in 21 minutes but, more importantly, changed the dynamic of Syracuse on both ends of the floor. Melo’s return adds some rebounding, opens up the middle for others to drive and score/dish and gives the Orange a defensive anchor in the middle of their zone. Melo doesn’t block every shot, but he alters a very high number. With the Brazilian big man roaming the paint, Syracuse is a legitimate national championship contender, something that was plainly evident on Saturday. Despite a backloaded schedule coming into view over the next few weeks, I’d be surprised if Syracuse loses another regular season game. Pittsburgh Is Back: Oh Jamie Dixon, why did we doubt you? We should have known better. After starting the conference season 0-7, Pittsburgh has won four straight games and is actually in a position to make a run at the NCAA Tournament. The Panthers’ resurgence has been keyed by the return of Tray Woodall and better play defensively. Woodall scored a career-high 29 points against Villanova on Sunday and the Panthers held the Wildcats to 36% shooting. That’s the Pittsburgh defense we’ve grown accustomed to over the years and if it keeps up, Pittsburgh will go dancing. Pitt faces a crucial week. It must take at least one (preferably both) road game of the two at South Florida and Seton Hall between now and Sunday. If the Panthers can get both, they’ll be 6-7 with three of their final five games at home. I actually feel safe saying something that would have been considered outrageous just two weeks ago: I believe Pittsburgh will be in the NCAA Tournament. Order Being Restored: Pittsburgh has won four straight. Seton Hall has lost six straight. South Florida lost by 30 at Georgetown on Saturday. Louisville has turned it around. All of that tells you something, doesn’t it? The Big East is shuffling back into place as we head into the home stretch of the season. While the Pirates and Bulls were nice early-season surprises and feel-good stories, reality has set in. Seton Hall was ranked in the top 25 as recently as January 9, but hasn’t won a game since a victory over DePaul the following day. The Pirates are anemic offensively and can hardly shoot 30% against any opponent. I wrote a piece last week about what has gone wrong at the Hall, but it shows no signs of stopping this tailspin anytime soon. South Florida remains at 6-4, but four of its final seven games are on the road as the schedule stiffens. The Bulls will play Pittsburgh twice, Syracuse, Cincinnati, Louisville and West Virginia down the stretch. Expect their 6-4 record to turn into something like 8-10 rather quickly. Even if that happens, it has still been a successful season for Stan Heath and his team. Nobody expected them to win even six or seven league games. This Weekend’s Lede. Forget the Super Bowl, it’s Rivalry Week across the college basketball nation… On Saturday, it was a Border War to remember, followed by a Sunday battle for bragging rights in Michigan, and we have a whole slew of great rivalry games coming up this week. From Florida-Kentucky to Duke-Carolina to Syracuse-Georgetown to even Gonzaga-St. Mary’s and Creighton-Wichita State, center stage is now ours. For the next 35 days until Selection Sunday, games will count a little more than they did before as teams position themselves for the postseason. And for that guy who says the college basketball regular season doesn’t matter? Remind him of three of the last five Super Bowl champions — one 9-7 team and two 10-6 teams won it all, while a 16-0 and a 15-1 team ended up ringless. This is why we play the games. Your Watercooler Moment. The “Last” Border War in Columbia Goes to Missouri. The storylines coming out of the “last” Border War game in Columbia, Missouri, on Saturday night were compelling — Game of the Year type of stuff. Even beyond the hyperbole about marauding Jayhawkers, divorced families and the finality of it all (we’ll wager the two schools are playing regularly again within five years), the game itself captured the essence of college basketball rivalry better than any other we’ve seen this year. Both Kansas and Missouri are outstanding teams, filled with playmakers on each side who are, depending on the day, equal parts dominant and confounding. For parts of the game, Kansas’ favorite whipping boy, Tyshawn Taylor, appeared the best player on the floor — driving the ball with confidence for a 21-point, highly efficient 9-15 shooting game; but it was his late-game mistakes that again cost his team when it mattered most. A turnover followed by two big misses at the foul line with KU down only one point leading to an admittedly questionable charge call, again punctuate his bugaboos (inconsistency and turnovers, especially in the clutch), issues that will haunt Jayhawk fans long after he’s gone. His counterpart on the Missouri side, Marcus Denmon, had backslid considerably from his scorching nonconference start (34.3% against Big 12 competition), but for the first time in his career against Bill Self’s team, he played a focused and effective game, going for 29/9 on 10-16 shooting and singlehandedly leading the Tigers back from the brink of a crushing home defeat. 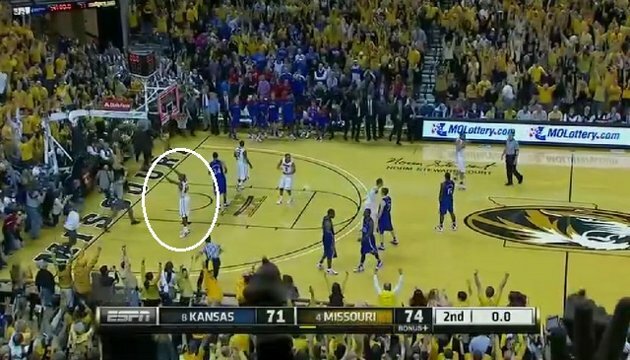 The senior guard dropped a one-man 9-0 run on the Jayhawks in the span of just over a minute, first with a layup and-one, then with back-to-back dagger treys, to erase KU’s eight-point lead with two minutes to go and put the Tigers in position to win the game with just under a minute left. KU’s Thomas Robinson (25/13) was once again the best player on the floor, but it was Denmon’s leadership and poise under pressure against the Jayhawks that made all the difference. His attitude at the end of the game says it all — he and fellow senior Kim English reportedly instructed the student section to stay in its seats rather than flooding the court in a massive RTC. With age comes wisdom, and his position is correct — elite teams only rush the court under very circumscribed conditions, and the Missouri seniors did not want their accomplishment sullied by giving Kansas the pleasure. At the end of the day, the Tigers still have a couple of major flaws that they have to mask (notably, interior size and a porous defense), but with playmakers like Denmon, English, Flip Pressey and a team that believes in itself, we expect that the dream season will continue in Columbia deep into March under first-year head coach Frank Haith. Fab Melo Returns, Boeheim Ties Dean Smith For Third in Wins. Sophomore Syracuse center probably doesn’t know who Dean Smith is, but maybe with his extra tutelage over the last two weeks, he found time to learn some college basketball history as well. On Saturday, though, he helped his coach Jim Boeheim make history with his 879th win as he contributed a career-high 14 points in his first game back from suspension and again anchored the patented SU 2-3 zone as the Orange destroyed St. John’s from start to finish at Madison Square Garden. Boeheim’s squad had struggled through a road loss to Notre Dame and two close wins at Cincinnati and West Virginia while Melo was out of the lineup, but if Saturday’s performance with him back is any indication, Syracuse may be looking at a one-loss regular season (and Boeheim could catch Bob Knight’s 902 wins as soon as next December). Some will disagree, but count me among those who think college basketball needs to start using a 24-second shot clock. Coaches have started to milk the clock so well that scoring is way down and the basketball is less interesting. 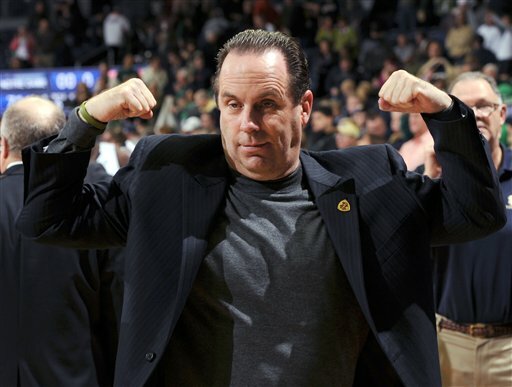 The biggest perpetrator of this in the Big East is Notre Dame’s Mike Brey and his “burn” offense. Give Brey credit for utilizing a style better-suited for his undermanned team, but the “burn” offense is about as interesting to watch as silent movies. The players in college are good enough to find a good shot in 24 seconds and some of them will need to learn it for the next level, so let’s just all agree to make the change and improve the quality of the game. Sometimes when you fall behind in school, you just have to buckle down and catch up. 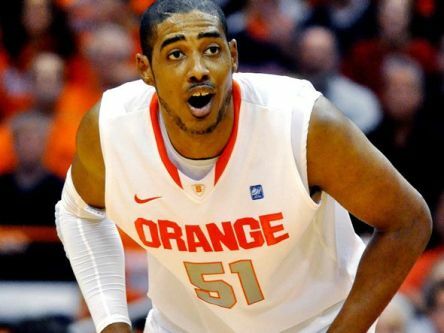 Just ask Syracuse center Fab Melo who apparently got his academics in order and will play Saturday when the Orange face St. John’s. Syracuse might not need Melo against the struggling Johnnies, but they will enjoy having him back in the middle of their defense for the rest of the season. He is one of the country’s best shot blockers and is an important defender and rebounder for a team with legitimate national title hopes. Most expected multi-talented Marquette point guard Vander Blue to pass Junior Cadougan on the depth chart this season and take the reins of the offense, but he has taken some time to get going. Now he says he has “found a groove,” though, which is good news for the Golden Eagles. Blue went for 16 points and eight rebounds in the team’s win over Seton Hall, and he has begun to assert himself on both ends of the floor. With all due respect to Cadougan, Blue is more talented and more athletic and he is the team’s answer at point guard as long as he stays in his groove. It’s time to sound the alarm in Storrs, Connecticut, if the bells aren’t already ringing. Give Georgetown’s defense some credit, but Connecticut shot 30% from the field for the game and went just 2-20 from downtown. Star guard Jeremy Lamb was the main culprit, taking 18 shots and making just four, including a 2-11 performance from behind the arc. Center Alex Oriakhi probably hit rock bottom last night and played just seven minutes without scoring a point and point guard Shabazz Napier committed his all-too-common ritual sacrifice of the act of shooting, going 0-9 for the game. Let’s be blunt, the Huskies are not an NCAA Tournament team right now, and they might not have enough juice to turn things around in time to get there. Hey Truck Bryant and Deniz Kilici! Are you guys listening? Yes, we know Kevin Jones is really, really good at this game called basketball, but even he can’t win games by himself. The senior forward is in the midst of an historic season and could be the first since Troy Murphy to lead the conference in both scoring and rebounding, but his team has been inconsistent. Naturally, his coach “feels bad” for him and agrees that the rest of his team needs to get it together. The good news for the rest of the team is that they have Jones on their team, so they only need to improve moderately and then let their big man handle the rest. Pittsburgh finally won two games last week and will look to win its third in a row at the Backyard Brawl in Morgantown. In Austin, Texas looks to stun highly-ranked Missouri. Rankings are subject to change with a new RTC Top 25 coming out today. After getting hosed by the referees at Syracuse, West Virginia returns home on Monday night to face rival Pittsburgh. While the Panthers have won two straight games after losing eight in a row, the Mountaineers remain a strong favorite despite Tray Woodall’s return to the Pitt lineup. The Panthers look like a different team with a healthy Woodall in the fold and Bob Huggins’ team will have to come up with a strong defensive effort in order to limit the Pitt point guard from getting into a flow. West Virginia’s two-point defense is not good, ranked #239 in Division I. If Woodall and Ashton Gibbs can get inside, Deniz Kilicli and Kevin Jones will have a hard time defending Nasir Robinson (9-9 FG vs. Georgetown) and Lamar Patterson. West Virginia’s biggest defensive strength is guarding the three-point line (25.9% in Big East play). If the Mountaineers can shut down Gibbs company from deep, they will have an easier time defending the paint and keeping the Panthers off the offensive glass, where they rank #1 in the nation. Pittsburgh’s offense has run much smoother with Woodall back but the biggest change might be defensively. The Panthers held Georgetown to 60 points and 47.5% interior shooting (below Pitt’s 51% in Big East play), something that will be very important against Jones and a West Virginia team that struggles from deep. If Pitt can force Truck Bryant into a bad shooting night (he’s had many of those), the Panthers will be in the game for all 40 minutes. Defending Jones is a very difficult task but Jamie Dixon just might be content to let Jones get his points and focus on shutting down Bryant and West Virginia’s young supporting cast. The Mountaineers need contributions from players like Gary Browne and Jabarie Hinds in order to win consistently. This is the 183rd meeting between these longtime rivals. Pittsburgh won both meetings last year and has won 16 of the last 23. We have a feeling this game will be closer than some might think. The Panthers look like a different team with Woodall back and healthy but West Virginia has the best player on the floor in Jones. Offensive rebounding is going to be the key in this game. Neither team defends the paint well but each crashes the offensive glass with authority. Pittsburgh has had problems with turnovers but that may not be the case with Woodall running the show. If West Virginia can’t create turnovers, it will have to score in the half court against a team playing with some renewed confidence. Call us crazy but we think Pitt has a legitimate chance to win this game. This one will come down to offensive rebounding and the play of Jones and Bryant.